Encountering a keen artist in Peru | Where to next? You meet all sorts of interesting people when you travel and it was a nice surprise to meet artist, Molly Keen, in eastern Peru. Molly is a young American live-wire who is painting her way through South America for as long as her money and enthusiasm hold out. 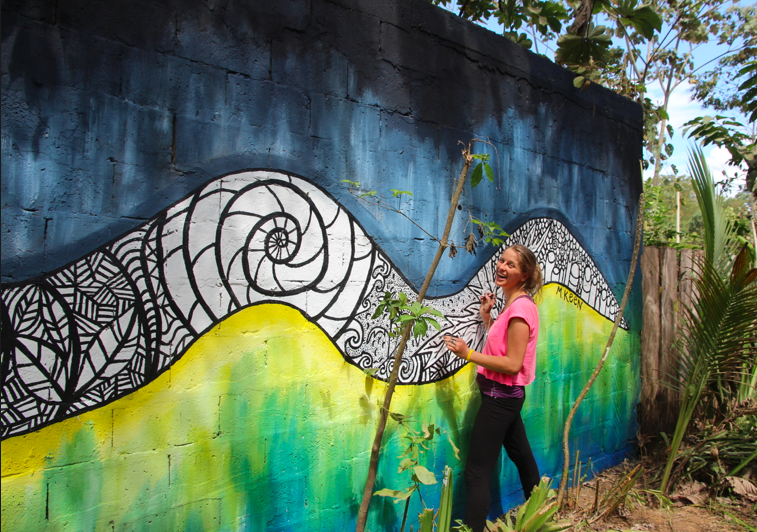 We met her in Puerto Maldonado where she was putting the final touches on a mural at Anaconda Lodge, where we camped for a couple of nights. Not surprisingly, Molly was painting an anaconda, although she did confess that she has never seen a live one. 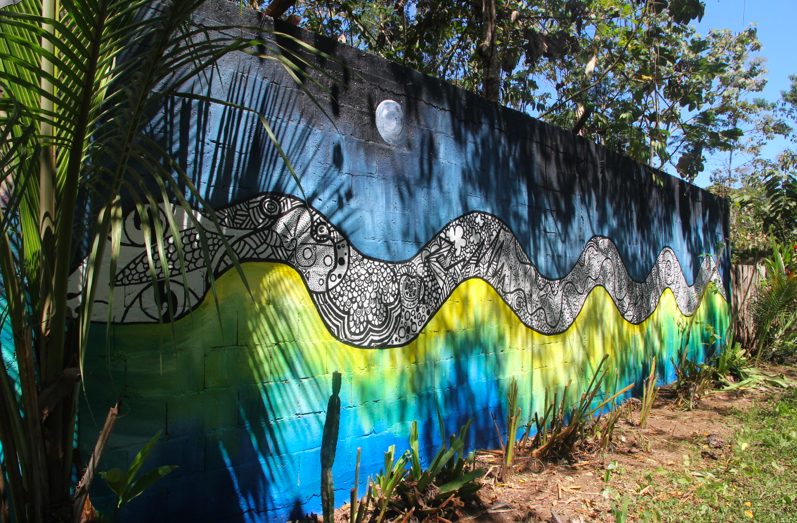 I was quite taken by the colours in her mural, as well as the Aboriginal look in some of the patterns. A friend of hers, Lukas, was helping to fill in some of the black line work. Molly is on her third country in South America. 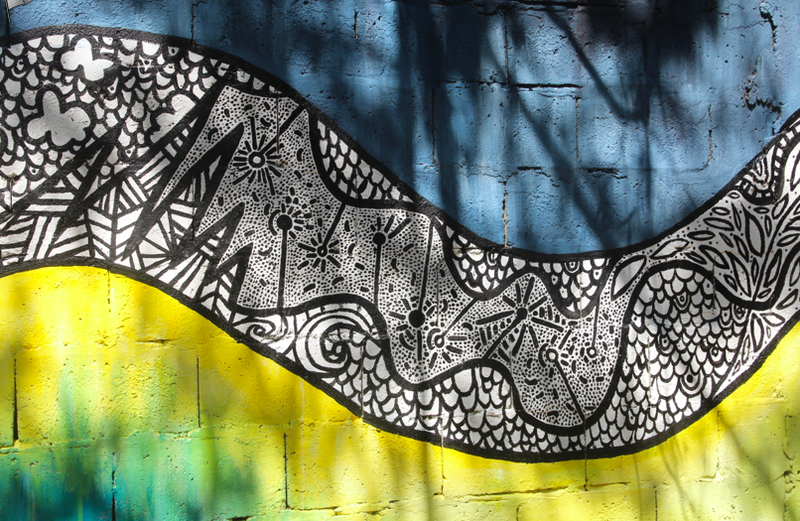 She has painted 15 murals in Colombia, another two in Ecuador and has just finished her first one in Peru. About the time we left for our trip in to the Amazon Basin, Molly was heading to Colca Canyon, where she has lined up another opportunity. At most places, she gets board and room for her efforts, and sometimes a bit of money. She reckons her style is changing over time and wonders just what it will be when she finishes her stay in South America. It’s obvious that she loves what she’s doing and her smile lights up everything around her. We wish her well. If you interested in seeing what else Molly’s up to, you can check out her blog or her art website. I plan to keep tabs on her. G’day and yes I love the people we meet along the way of traveling too! Looks like Molly has incorporated the ways of the Aboriginals into her art too! Hi Joanne, you should have a look at her blog and see how her art is changing over time. Or maybe she’s just using her gift of variety. At any rate, her work is beautiful. Thanks for that Peggy. It is indeed a beautiful mural. I especially like the blues, greens and yellows. And you’re quite right—her anaconda is very reminiscent of Aboriginal art. I’ve enjoyed all of your other posts too. Thanks Kubra. I hope you have time to check out Molly’s blog page about herself. She’s such a lovely person and I see her talent blossoming. It will be fun to see her work progress. I hope she comes to Australia one day, so I can show her some Aboriginal art.